Our Roll-Bag Emergency Medical Kit is the perfect size first aid kit for home, work, vehicle, RV and camping! Conveniently packaged in navy blue roll bag with twelve pockets, this emergency medical kit provides a wide range of essential first aid supplies along with a 30-page AMA first aid & CPR guide. 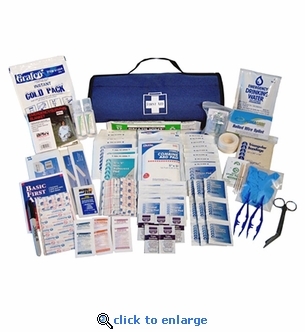 This kit exceeds ANSI Standard Z308.1.2009 for workplace minimum first aid supplies. 4 X-Large Fabric Knee Bandages 2" x 4 ½"
20 Fabric Bandages 1" x 3"
Lister Bandage Shears 5 ½"
Emergency Mylar Blanket 54" x 80"